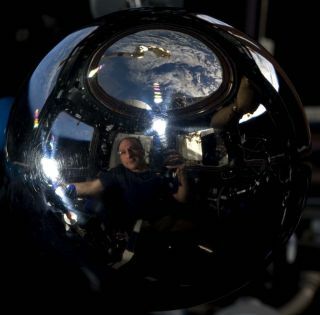 Don Pettit takes a self-portrait in the Cuopla of the International Space Station. Call him the cosmic Renaissance man: American Don Pettit is an astronaut, a scientist, and now, a poet. Pettit, who has a reputation for oddball space experiments, is currently living 240 miles (386 km) above the Earth on the International Space Station, has written an ode to orbit called "Space Is My Mistress." The poem, written for National Poetry Month in April, was posted on NASA's website and on Pettit's blog at the website for Smithsonian's Air & Space Magazine. "We dance on the swirls of cloud tops, while skirting the islands of blue. You know my heart beats fast for you," the astronaut wrote. And this isn't even his first trip beyond Earth. Yet while his love for space is clear, the astronaut's poem rings with longing for Earth. "I marvel at your figure, defined by the edges of continents," he wrote. "You gaze at me with turquoise eyes, perhaps mistaken for ocean atolls." Pettit is scheduled to end his current stint on the Expedition 31 mission and return to Earth in May.